Coat of arms and badges registered in The Chinese Armorial on January 12, 2019. 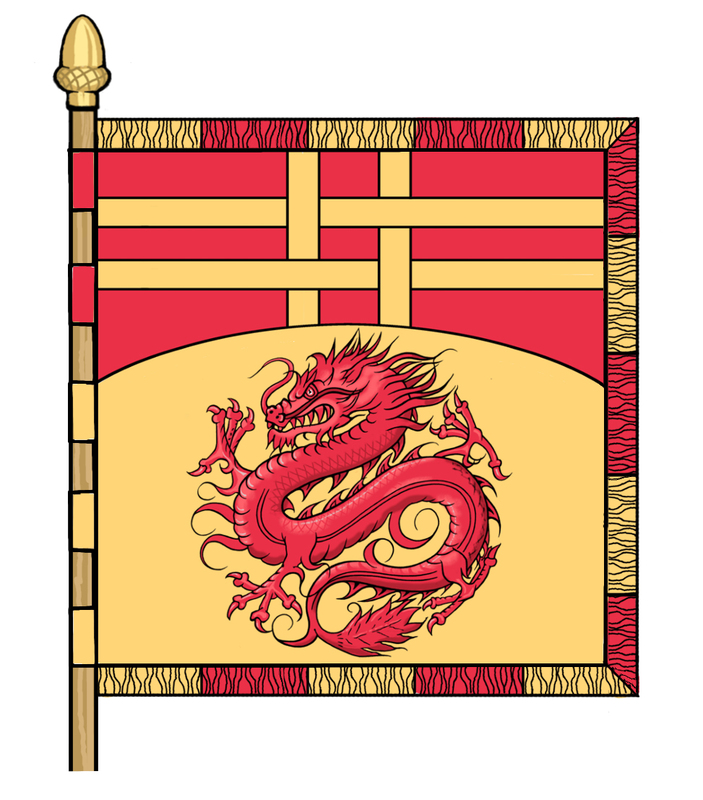 Standard and armorial banner registered in The Chinese Armorial on February 22, 2019. Arms: Per fess arched and enhanced Gules and Or in chief a cross double parted and fretted of the second and in base a Chinese dragon globular of the first. Crest: A dragon’s foot Gules armed Or grasping an oak tree eradicated Proper acorned Or. 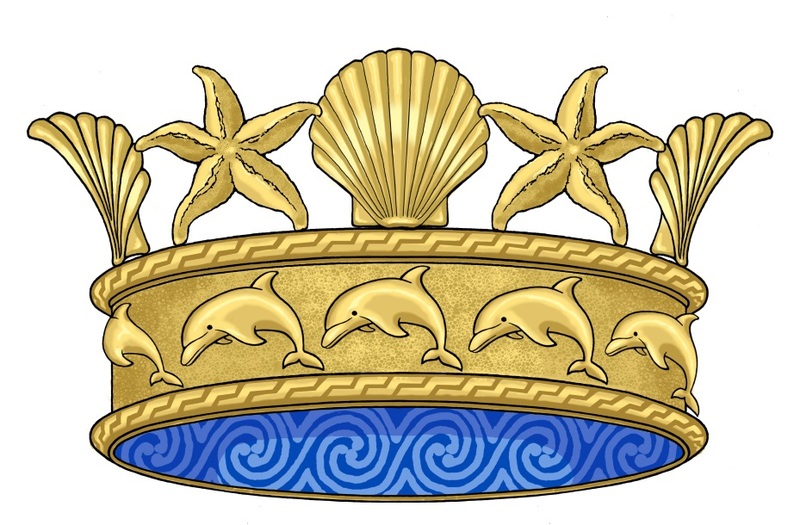 Badge #1: A Coronet the rim set with Estolies of five points alternating with scallop shells the band set with bottlenose dolphins naiant all Or lined Azure. Badge #2: A Bezant thereon a Chinese dragon globular Gules. Standard: A standard, the arms in the hoist, the fly divided into three compartments by two bends Sable inscribed with the Motto in letters Or. The first and third compartments Gules bearing the sea coronet badge, the second compartment Or bearing the Chinese dragon badge. Grant: coat of arms: Office of the Chief Herald of Ireland, July 17, 2018. Volume Aa Folio 91. Badges were assumed in 2018. Standard and armorial banner were assumed in February 2019. The arms were designed in 2018 by Michael O’Comain, the Irish Herald of Arms. The coat of arms was granted by the Chief Herald of Ireland in 2018. The two badges are assumed. The armiger is of Irish and British descent. His wife is Taiwanese, and therefore, their daughter and heraldic heir is of Chinese descent. 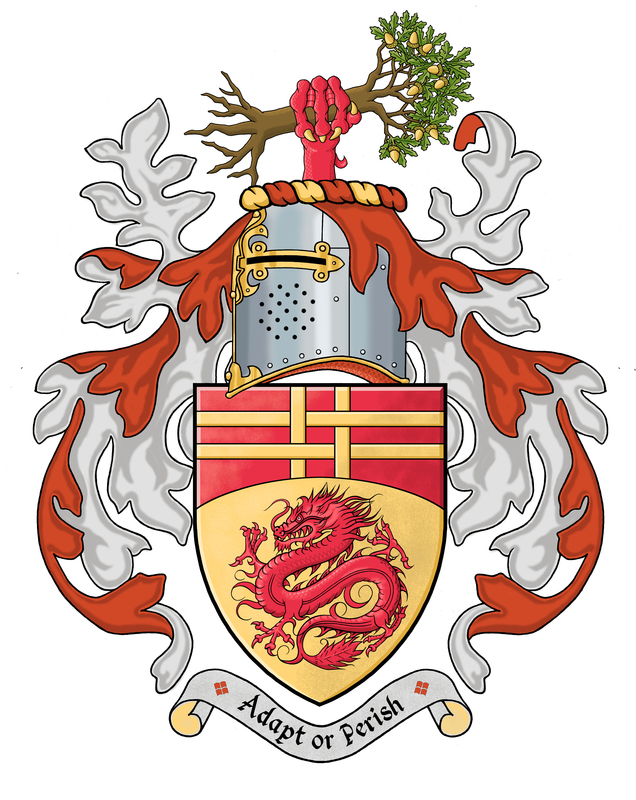 Hence, The Chinese Armorial is registering his coat of arms, of which a differenced version can be used by his daughter in his lifetime and which she will inherit in due time. The red Chinese dragon represents the armiger’s strong connection with the island of Taiwan. The armiger worked as a Consultant on the Taiwan High-Speed Railway project, both before and after the railway’s entry into service in 2007. The armiger was born in the year of the Wood Dragon in the Chinese zodiac. His official name in Chinese, adopted when his daughter was born in Taiwan, includes ‘Lucky Dragon’ (劉瑞龍). 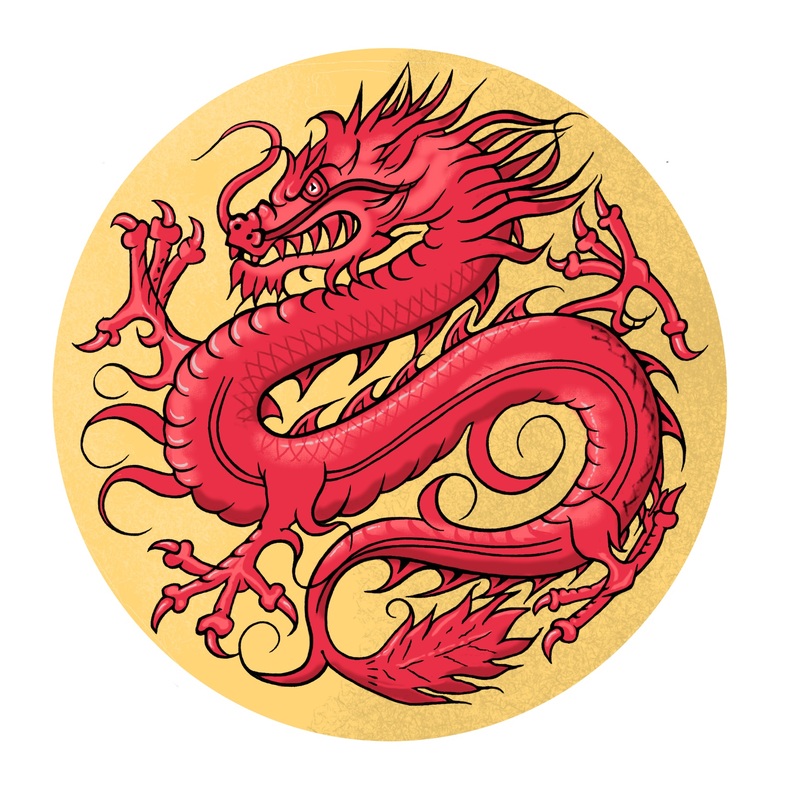 The red Chinese dragon on the shield, with its circular shape, is a charge previously unknown in Irish heraldry, which required the Herald of Arms to use innovative blazonry; he created the term globular to describe the dragon’s posture. Note that the number of claws on each claw of the dragon is not specified in the blazon. This seems to be the practice of the English, Scottish, Irish, and South African heraldic authorities but not of the Canadian Heraldic Authority. The parallel lines at the top of the shield represent railway tracks symbolize the armiger’s 25-year career in the railway industry, as well as many British and Irish ancestors who worked on the railways, one of whom tragically lost his life in an accident at Westland Row Station in Dublin in 1926. The oak tree in the crest represents the armiger’s Bachelor’s degree in environmental science and time spent doing conservation volunteer work for the National Trust organisation, whose logo is a sprig of oak leaves and acorns. The motto Adapt or Perish is a quote from the Victorian science fiction writer H.G. Wells who lived in the armiger’s adopted home town in the United Kingdom. It refers to the importance of moving with the times, embracing change and keeping up to date with technological advances in this fast-changing world. The sea crown badge was assumed in March 2018; it was designed by the Armiger and Danilo Carlos Martins of Brazil. It is an imagined crown for Manannan, the sea deity in Irish mythology. The family name of armiger’s Irish ancestors, Murnane, is believed to be derived from Manannan. The bottlenose dolphins in the crown represent the dolphins that regularly visit Killiney Bay in County Dublin, where this branch of the Murnane family once lived.